L'CHAYIM, a word used in toasts and blessings, literally means “To Life” and we use it to express the vitality of Jewish life in Southwest Florida. L'CHAYIM, the name of our monthly newspaper, keeps thousands of local readers informed about local, national and international Jewish news. L'CHAYIM has articles submitted by the Jewish clergy and lay leaders in Lee and Charlotte Counties. Our board members and staff contribute articles of interest to the readers. As with any newspaper, the “glue” that keeps the articles together is the advertising. This publication is mailed to 5,000 + homes and businesses and is available to everyone at local synagogues, hotels, bagel shops and delis. Our regular advertisers vary from dentists to diners, featuring national companies with local stores, real estate agents, and service businesses. JOIN US for coffee, bagels and the simple satisfaction that comes from meeting and making friends with other volunteers, as we help keep thousands of local readers informed about local, national and international Jewish news. Contact Debbie Sanford for information on labeling dates. L'CHAYIM, the name of our monthly newspaper, keeps readers informed about local, national and international Jewish news. Reach our affluent, informed, health-conscious, and savvy readers who are looking for new and better ways to enrich their lives and those of their loved ones. L'CHAYIM is mailed to 5,000 Jewish residents in Lee & Charlotte Counties. 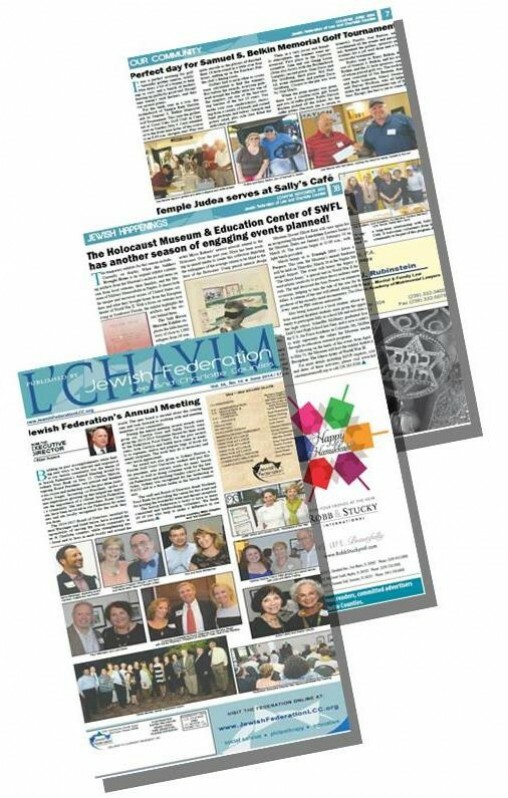 Each month, readers of L’CHAYIM get news and updates on all Jewish-related local events including the Jewish Film Festival, Jewish author programs, holiday celebrations, concerts, food festivals, book study groups, mah jongg, and much more.